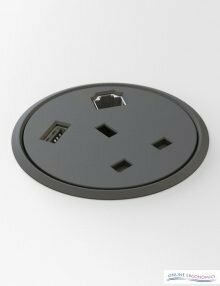 The Desk Port Power Socket Fits into 80mm desk port holes on our desks. This adds a power socket at desk level in a neat and space saving way. 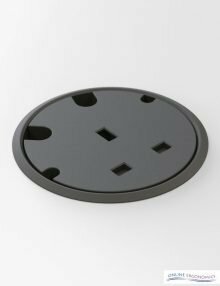 The Desk Port Power Socket Fits into 80mm desk port holes on our desks. This adds a power socket, USB Charger and Data port at desk level in a neat and space saving way. 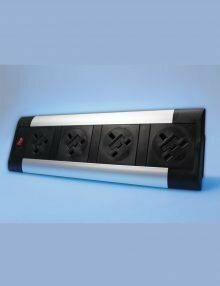 Desktop units have individually fused UK power to BS6396 with a British plug and a 3 metre lead. Supplied with desk clamps and mounting blocks, Master Power Switch, Black with a tough aluminium body, Short lead to Wieland connector. Please note the product image is of Model DCP4S. Extra AV Modules can be added to the Desktop or Vertical Pop-up units. Options: VGA, HDMI, 3.5mm audio jack, USB. These must be added to the unit at time of ordering at an extra cost, please contact us for a price.